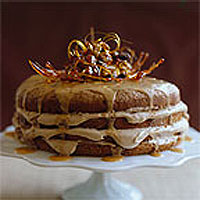 To decorate, make caramel as in the Coffee Pecan Praline Ice Cream recipe. Dip nuts in the hot caramel and leave to set. Drizzle hot caramel over an inverted, lightly oiled bowl and leave to set into a 'basket'. Remove and place on the cake, filled with caramel-coated nuts. Preheat the oven to 180°C/gas 4. Grease and line an 18cm round, deep cake tin. Scrape the seeds from the vanilla pod. Put in a bowl with the eggs and sugar. Whisk until thick and pale and a trail stays on the surface for 5 seconds. Sift the flour and espresso powder into the egg mix, and fold in. Transfer to the cake tin, level the top and bake for 25 minutes, or until a skewer inserted into the cake comes out clean. Cool for 10 minutes in the tin, then turn onto a rack. Leave until cold. Meanwhile, make the filling. Beat the egg yolks with the sugar until thick and pale. Gradually beat in the flour, then the hot coffee. Transfer to a pan. Heat gently, stirring constantly, for about 5 minutes, until you have a thick paste - give it a whisk if you get any lumps. Pour into a bowl. Cover the surface with cling film and set aside until cold. Just before you want to use it, whip the cream until it holds stiff peaks and fold in the coffee mix. To assemble, cut the sponge into 4 layers. Put the base on a plate and spread a third of the filling over it. Add another sponge layer, and another third of filling. Repeat, finishing with the top layer of sponge. To make the icing, sift the icing sugar into a bowl and mix in enough coffee to get a thickish, just-pourable consistency. Pour over the cake, letting it run down the sides. Chill for 30 minutes before decorating and serving.